Are you having aches and pains that are affecting your golf? The golf swing is a complex movement that utilises the whole body in a coordinated fashion and when repeated frequently can result in injury. A good understanding of golf injuries requires the practitioner to consider the quality, quantity and type of golf swing employed by the golfer. Overuse injuries are the type of injury to most likely occur, commonly causing low back pain, neck pain and shoulder pain. The dynamic action of the golf swing is a major contributing factor to injury. 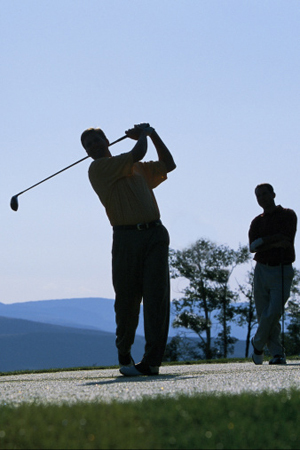 Golf Swing Analysis Service – to analyse and identify areas of concern and opportunity. Golf Conditioning Programs- to help improve your game and reduce injury. A Doctoral Thesis on Golf Injuries – Dr McHardy PhD is an internationally recognised golf injury speaker. All ages of golfers can experience problems. If you don’t seem to swing the club as well as you used to, or it’s causing you pain, we can evaluate you. Chiropractor Rian Kenny and Chiropractor Andrew McHardy have trained with the Titleist Performance Institute and can provide treatment specific to your golf-related concern. Ready to heal naturally and get back out on the green? We’d love to help you achieve your goals naturally. Learn more today by contacting us to book your first visit or by calling 02 9522 2125.